Some trails in La Mauricie National Park are perfect for Ski-Dooing. Ski-Dooing on a mountainside in La Mauricie National Park. The first time I drove to La Mauricie National Park, I was all alone and I thought I knew what sort of adventure I was setting myself up for. 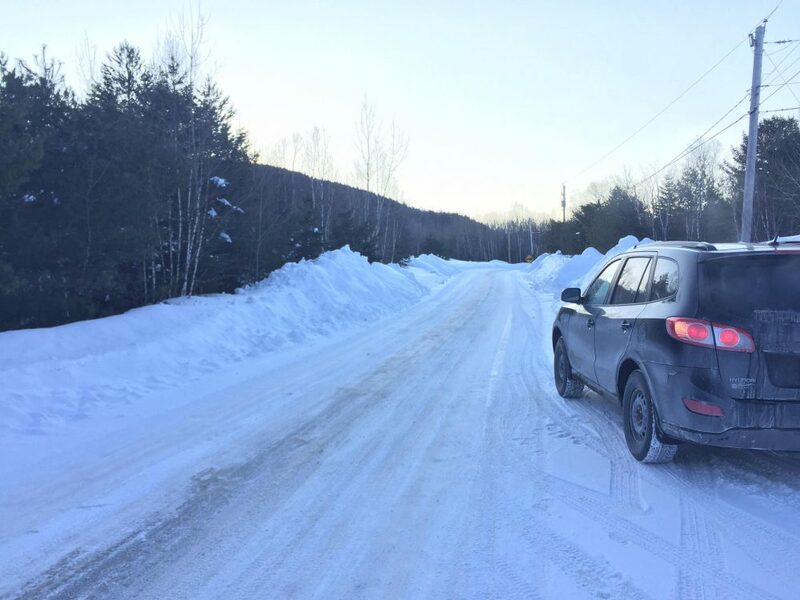 I wanted to write about the free-for-2017 Discovery Pass, and La Mauricie was the national park near me that was open in winter, so I dropped my family in Otterburn Park for winter camping with their Beaver and Cub troupes and headed (later than I meant), north toward the park. After several hilarious-in-retrospect adventures with an ancient GPS, I found myself alone with Joe the Truck on mountain roads that were sheer ice with packed snow over them. Plows had spent the winter clearing the road and building great snowbanks on either side, meaning there was almost no way I’d find myself ditched if I slid too exuberantly. It was like bowling with the kiddie bumpers up. We had so much fun on the road, up and down, side to side, around curves and past a covered bridge, that I was barely disappointed when the GPS lead me directly to the wrong entrance to the park — an entrance that was closed for the winter. Hey, y’all, sometimes it’s just about the drive. Nope. There’s more road and forest out there, but Joe the Truck and I weren’t allowed to check it out.You can click through here to find out what happened when I went back the next weekend with most of my family to try my hand at winter camping. I give La Mauricie National Park three (completely arbitrary, out of five) stroller wheels. The trails were great and we loved the way station where we could start a fire and share our marshmallows with other travellers. More than half the park was closed for winter, and trail maps weren’t super easy to follow. We hope to bring it up to four or more stroller wheels when we go back during the summer. Find out how to get your Parks Canada 2017 Discovery pass (it’s free this year). Inside La Mauricie National Park, several trails were open for the season.